Whilst the winter of 2013/14 will be remembered for the flooding resulting from the passage of low pressure after low pressure across the UK, as we move into Spring we are facing the consequences of high pressure (or anticylonic) systems. These anticyclones have brought clear skies and warm weather but have also contributed (so far) to two sustained episodes of poor air quality across England and Wales. Specifically, levels of particulates in the atmosphere (known as PM2.5) have been high or very high in the period 10-14 March and levels are very high as I write in early April (as seen in the measurements at Harwell in Figure 1). Figure 1. 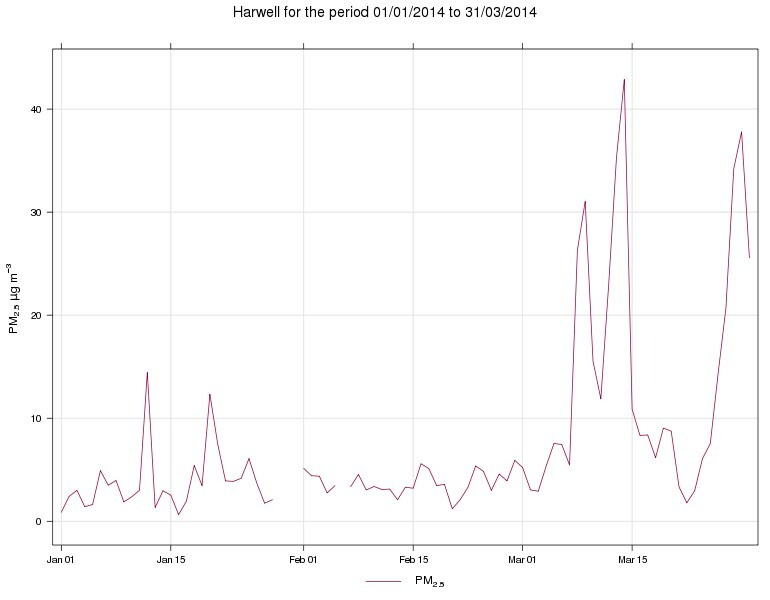 PM2.5 measurements at Harwell in Oxfordshire for 2014 to date. Data and figure from http://uk-air.defra.gov.uk/ and the OpenAir resource. The PM2.5 particles that affect the UK are mostly made up of a complex cocktail of droplets and solid particles containing black carbon, organic carbon, ammonium sulphates and ammonium nitrates. Sources of the particles or the gases that are their precursors include traffic, fossil fuel burning, and agricultural processes. Harwell is shown here because it is classed as a rural site rather than a roadside one. Raised levels at a rural site probably reflect pollution due to the large scale weather situation rather than local emissions of particulates whilst roadside (particularly central London) measurements are also significantly affected by local traffic. PM2.5 is an irritant and can be breathed in to the smallest parts of our lungs. You might experience a sore throat and breathing difficulties, particularly if you are physically exerting yourself. Some of the things carried on the particulates can be absorbed into the bloodstream and store up trouble later on, particularly for those with heart problems. High particulate levels also cause reductions in visibility – most (or should that be least?) clearly seen as milky-white skies (due to high aerosol optical thickness as shown in Figure 2 from the Chilbolton AERONET site) and hazy red sunsets. It is important therefore to understand how and why these episodes occur. Figure 2 Aerosol optical thickness (a measure of how much of the sun’s radiation is blocked by the aerosol in the atmosphere). Preliminary data from Chilbolton AERONET site. Some of this data may be contaminated with cloud signal and the real numerical values are subject to quality control, but the change from low levels in February to variable with high peaks in March is striking. In 2008, I was part of a project called ADIENT which set out to measure and understand the particles in the atmosphere around the UK, in particular to understand the role of aerosol transported from continental Europe compared to that produced locally within the UK. During May 2008 we flew the Natural Environment Research Council Facility for Airborne Atmospheric Research’s BAE-146 aircraft across northwest Europe as part of an EU funded project called EUCAARI. We made measurements of aerosol composition and size, as well as their effect on radiation passing through the atmosphere. In that case, a high pressure system was situated over Scandinavia and measuring over the southern UK we found lots of organics and nitrates consistent with aged pollution, i.e. emissions from traffic un continental Europe undergo chemical transformations in the atmosphere as they are carried by the wind (see e.g. Esteve et al, 2014, Highwood et al, 2011, Morgan et al, 2011). Light winds and little rain typically associated with anticyclones prevent the PM2.5 being blown away or washed out. The most recent episodes seem also to have a significant amount of aged aerosol transported to the UK thanks to the weather patterns. 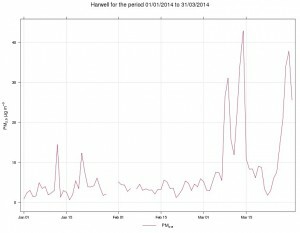 The first “high” episode around 12-13 March 2014 led to the highest PM2.5 event in London for 2 years. A ridge of high pressure to the west of the UK, and a low pressure to the south-east over Spain combined to give easterly flow over the UK. Air masses reaching the UK had travelled over northern Germany, Belgium and Holland allowing for plenty of aging. Ground based chemical composition measurements again showed the presence of lots of organics consistent with aged aerosol. During the current episode, we again have easterly or south-easterly flow across England and Wales bringing in aged pollutants to combine with the particulates produced locally. However we also have Saharan dust in the mix this time. Dust picked up over Algeria and Tunisia has been transported by the winds up to the UK. We see dust episodes like this several times a year. 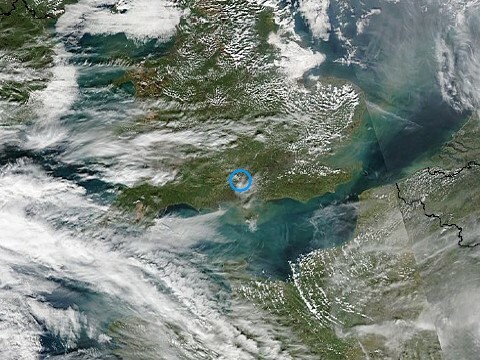 The Met Office have made a lovely video of the current episode as seen from satellites that you can find on their blog. Figure 3 shows a quick look from MODIS that shows the mix of clouds and aerosol over the UK. The brightest white is clouds and you can also see the change in ocean colour close to the coast, but it is just possible to see a hazy pale brown of dust underneath the cloud. Figure 3 MODIS quick look image from 1 April 2014. Dust can be seen underneath the cloud to the south of Cornwall and Devon. The position of Chilbolton AERONET site is show by the small blue circle. This entry was posted in Environmental hazards, Weather. Bookmark the permalink.